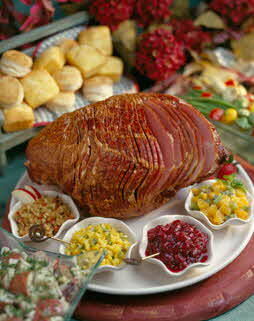 Place ham in shallow pan and heat in a 350 degree F. oven, uncovered, for 1¼ to 1½ hours or until an inserted meat thermometer reads 140 degrees F. (about 15-18 minutes per pound). Simple and basic and goes with any traditional side dishes. Serve with a couple different fruit salsas or chutneys, like Orange-Mint Salsa or Sweet-n-Hot Apple Chutney from the condiment area.